Over the last few months I have read three books in this “Baptist Classics” series. The first two, on E.Y. Mullins and J.M. Frost and their contemporaries, were more encouraging histories of the Southern Baptist Convention from the days before liberalism set in. This volume highlights Herschel Hobbs who was the chairman of the committee that drafted the 1963 revision of The Baptist Faith and Message, the official doctrinal statement of the SBC. The original BFM was drafted in 1925 under the leadership of Mullins, and the third and latest draft was in 2000 under the leadership of Adrian Rogers. The 1963 BFM was the one greatly influenced by the liberal wing of the Convention. One can easily find all three drafts in a side by side format online. Before I review the book on some specifics, let me summarize a few of the problems that the 1963 BFM had under Hobbs’ leadership. First, the lengthy Preamble (which all three versions have) in 1925 includes the statement, “That the sole authority for faith and practice among Baptists is the Scriptures of the Old and New Testaments.” The 1963 Preamble changed that to say, “Therefore, the sole authority for faith and practice among Baptists is Jesus Christ whose will is revealed in the Holy Scriptures.” Does our authority start with the Scriptures where we find all we know about Jesus Christ, or does it start with what we know about Jesus Christ and some of that is revealed in the Scriptures? The 2000 BFM changed the statement back to the 1925 wording. Third, the first section also has this statement (appearing in all three versions), “It has God for its author, salvation for its end, and truth, without any mixture of error, for its matter.” There may not be any intentional deviation, but one Southern Baptist, Norm Miller, whose father, Eldridge Miller, was at the 1963 convention has commented, “Dad told me the Modernists had influence in the placing of commas around the clause that follows the word ‘truth’. . . Remove the commas, and ‘Without any mixture of error’ applies to the entire statement about the Bible. As adopted in 1963, however, ‘Without any mixture of error’ applies only to the ‘truth’ that is found in the Bible.” (Baptistbanner.org/Subarchive_7/700 Berean or Beratin.htm) It may also be asked whether the Bible “has” truth without any mixture of error, and has other truth as well. But, again, it should be noted that this statement is the same in all three versions. And so, a book that tries to exonerate Hobbs’ work on the 1963 committee has its work cut out for it. In this book, only the first chapter is Hobbs’ own work. It is titled, “The Baptist Doctrine of the Holy Scripture” and is a “posthumously published essay . . . [which] affirms the doctrine of biblical inerrancy.” In this essay, however, Hobbs defends both the “Plenary Theory” and the “Dynamic Theory” of inspiration (p. 15) and clearly defends theistic evolution, “Did God create the universe and all those in it in six, twenty-four-hour days? Not necessarily. . . ‘In the beginning’ can refer to one second or to vast eons” (p. 20). But Hobbs notwithstanding, I found the rest of the book to be very much worth the reading. Of special note is “Baptists and Higher Education” by Carl F.H. Henry; “The Church in the Twenty-First Century” by Paige Patterson; and “Worship” by David Dockery. Other chapters were more directed to specified ministries within the church which may or may not be of interest. As an independent Baptist, I am not greatly influenced by today’s Southern Baptist Convention. I must add that one chapter in this book did more for my understanding of the Convention (and not necessarily for the good) than anything I’ve read in a long time. It is, “Holding the Ropes: A Strategy for Christian Stewardship” by Morris H. Chapman. This is a detailed chapter on why the Cooperative Program exists and how it came about. In short, it says that since individuals won’t tithe as they should, and churches on their own won’t give to missions as they could, the SBC invented the Cooperative Program to do it for them. Money is given by the churches and the Convention makes sure it is used properly. Though Chapman tries to argue that this is a “visionary” way of supporting missionary work, it has taken the decision of the local church, regarding its own money, out of its own hands and given that decision to a national organization. To an independent Baptist who believes in faith missions, this is unacceptable. 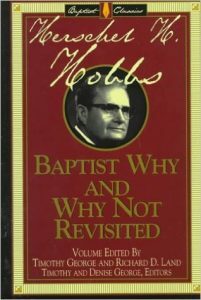 Despite my various views of the Southern Baptist Convention and the problems with Herschel Hobbs, I still learned a lot from this book and this series. I had to grind the gears a little to get through it, but I would still suggest it to Baptists wanting to learn about their history.